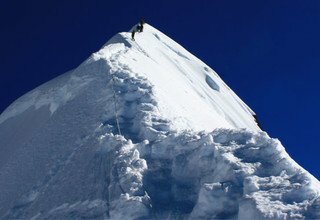 The name Island Peak is given to this peak because of its appearance as the island of the ice on the elevated regions of the Himalayas of Nepal. 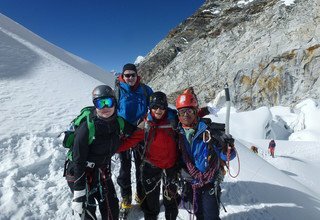 Island Peak Climbing is one of the most classical trips in the Everest region offering us with the magnificent views of the mighty Himalayas from Kalapatthar and Everest View Hotel. Island Peak Climbing in Nepal offers us with one of the most fascinating experiences of climbing the peak in Khumbu region. 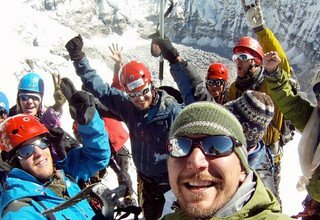 Our journey of Island Peak climbing Itinerary starts from the scenic flight over the green lush valleys to Lukla. After landing on one of the most dangerous airports in the world, we begin our journey by trekking to Phakding and reach Namche Bazaar. 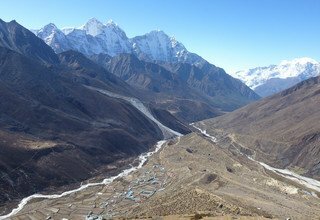 We then trek through traditional Sherpa villages like Tengboche, Pangboche and Dingboche to head towards Everest Base Camp. Finally heading towards the Island Peak Base Camp, the glorious mountains keep us company throughout the trek. As the trail passes through the Khumbu region which is also marked as the lands of Sherpas, we will get chance to enjoy the local tradition, custom, dance, and culture. 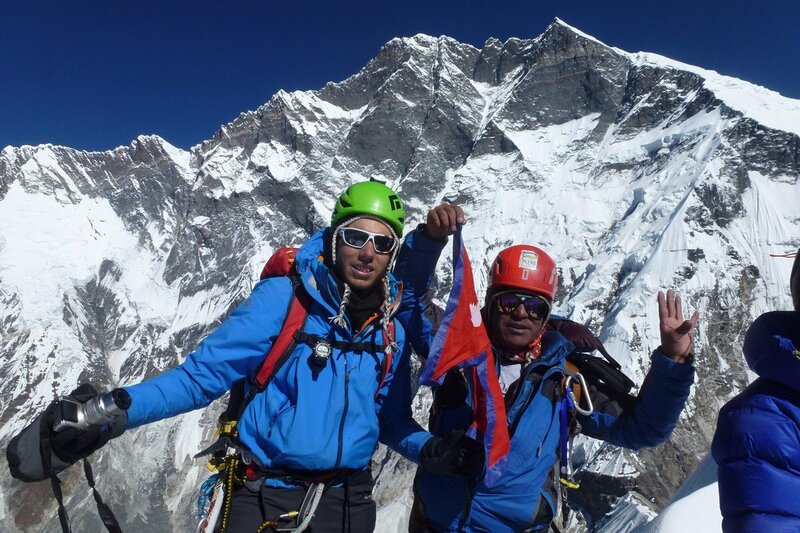 Climbing Island Peak Nepal is considered as one of the most fascinating extensions in the Everest region. 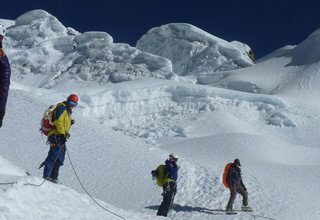 The mountain itself is considered as the extension of the south ridge of Lhotse Shar. 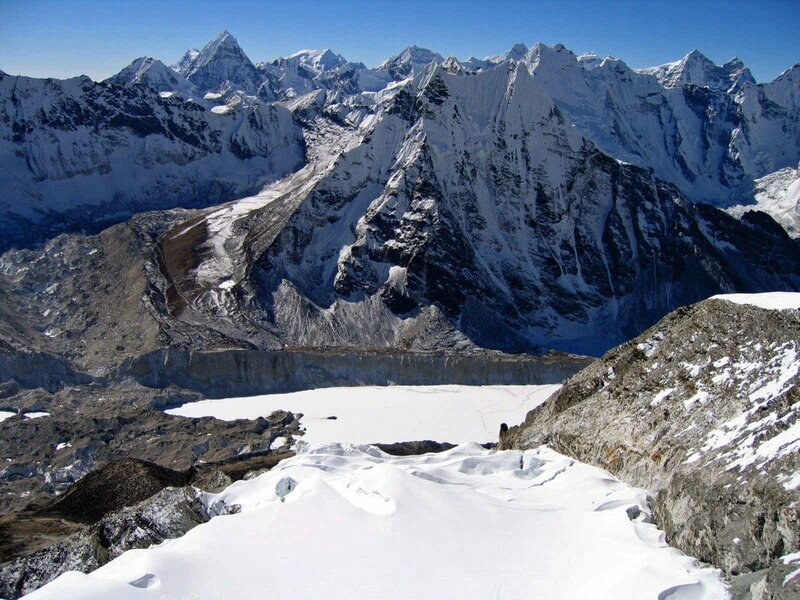 Situated over the Chhukung glacier between Ama Dablam (6856m) and Lhotse Mountains, the Island Peak is one of the most sought trekking destinations by the mountaineers and adventure seekers because of its challenging geographical conditions. 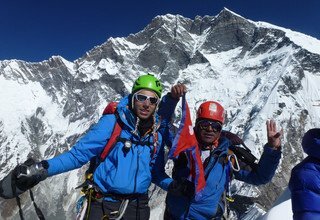 We don’t need any technical mountaineering experience to climb Island Peak, however, a high level of fitness and the desire to push our limits is sufficient. 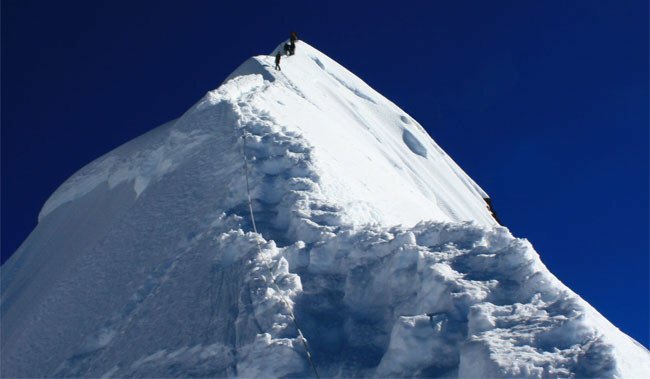 The experience of climbing along the Island peak will be quite challenging and thrilling. 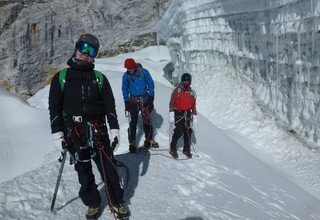 Swiss Family Treks and Expedition has been one of the most reputed and competent companies for years. We have a passionate and experienced team in tourism serving our clients with all the requirements they need. The transportation and accommodation facilities we offer throughout the trek are excellent and we also provide English-speaking guides to help you better in your journey. On your arrival at Kathmandu Valley, one of our staff members will be there to pick you up and transfer you to the Hotel. Overnight at a 3-star Hotel in Kathmandu. This day will be reserved for full day sightseeing around the Kathmandu Valley. We will visit several of the world heritage sites in Kathmandu Valley. We will visit the famous sacred Hindu temple- Pashupatinath, the Monkey temple- Swayambhunath Stupa and the largest stupa in the world- Boudhanath Stupa. These places have also been enlisted as world heritage sites by UNESCO. In the evening we will return back to the hotel after a full day of sightseeing. Overnight at a 3-star Hotel in Kathmandu. On this day we will drive back to the airport and catch a scenic flight to Lukla. Enjoying the scenic flight for around 45 minutes with views of high mountains of this esteemed region, we will reach Lukla. We will have our breakfast there and then we will start our trek along the descending trail passing many Buddhists monuments to Phakding. Overnight at a Lodge at Phakding. Today, we will initially walk for around three hours crossing many suspension bridges and villages to Monjo. At Monjo, we will enter the Sagarmatha National Park and make way up the trail enjoying glorious views of mountains and naturally thriving flora and fauna. From there, we will climb to Jorsalle. The trail steeply ascends until we cross the large suspension bridge to reach Namche Bazaar. Overnight at a Lodge at Namche Bazaar. This day will for acclimatization and rest. We will utilize this day by taking a short hike around Namche Bazaar. 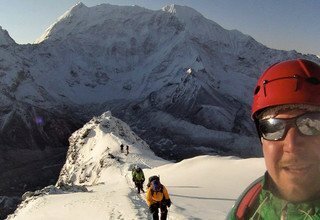 We will climb to Everest View hotel to enjoy the stunning views of Mt. Everest (8848m) and other high mountains peaks in the region. From there we will descend to Khumjung village, where we will visit the famous old monastery and see the Yeti skulls hanging in the monastery. We will also visit Khumjung Hillary School and then return back to Namche. Overnight at the Lodge at Namche Bazaar. We will leave our lodge in the early morning and follow the trail leading to Kyangjuma village. From here, the trail follows the Dudh Koshi River to the suspension bridge leading us to the Phunki Tenga. We continue along the narrow steep trail to Tengboche. 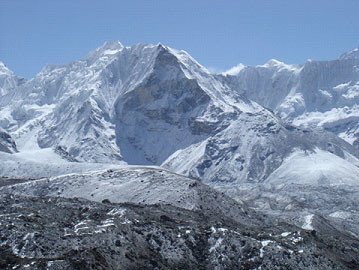 On reaching Tengboche we will visit the Tengboche monastery and enjoy the panoramic views of the mountains in the Everest region. Overnight at a Lodge at Tengboche. Initially, our trail starts along the ridge lines to Khumbu Khola Valley and then to Thokla. We can enjoy the majestic Himalayan views of Pumori (7165m), Nuptse (7861m), Lobuche (6367m), Ama Dablam (6856m) and numerous other peaks. 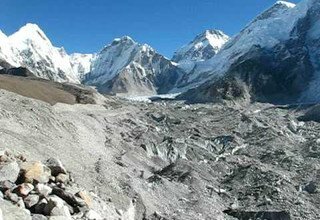 From here we will climb along the lateral moraines of Khumbu glacier and continue to ascend to Lobuche after passing Thokla pass (4830m). Overnight at in a tented camp at Lobuche. 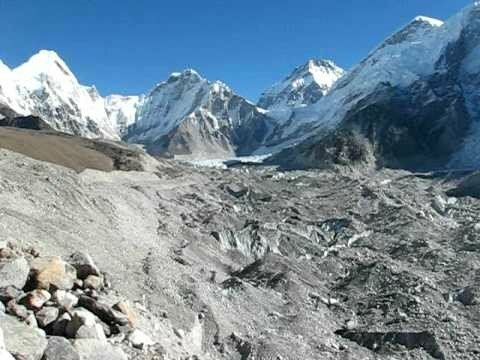 Day 9: Trek from Lobuche to Gorakshep 5140m/3 hours and Exploring the Everest Base Camp 5364m. 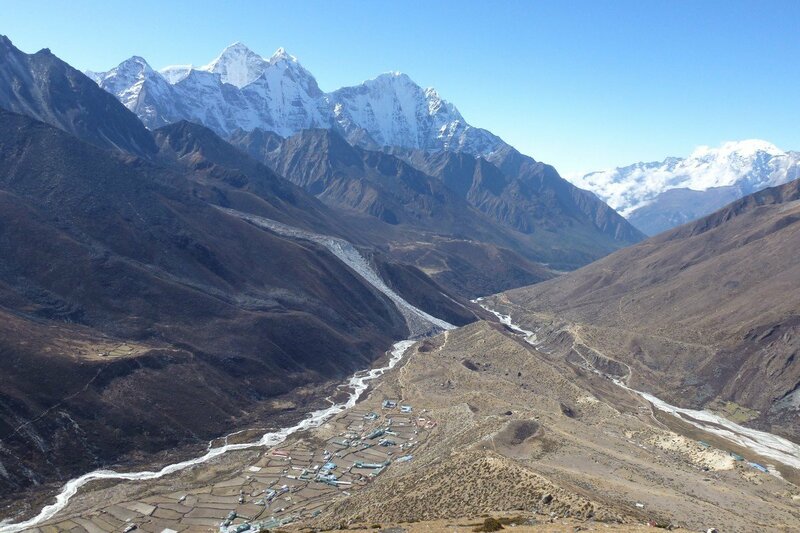 The trail passes along the left bank of Khumbu glacier and climbs steeply to Changri glacier. The trail gently ascends to Gorakshep where we will enjoy the magnificent views of Pumori (7165m), Lingtren (6749m), Khumbutse (6608), Nuptse (7861m) and many others. Enjoying the beautiful mountain views we will head toward the Everest Base Camp. 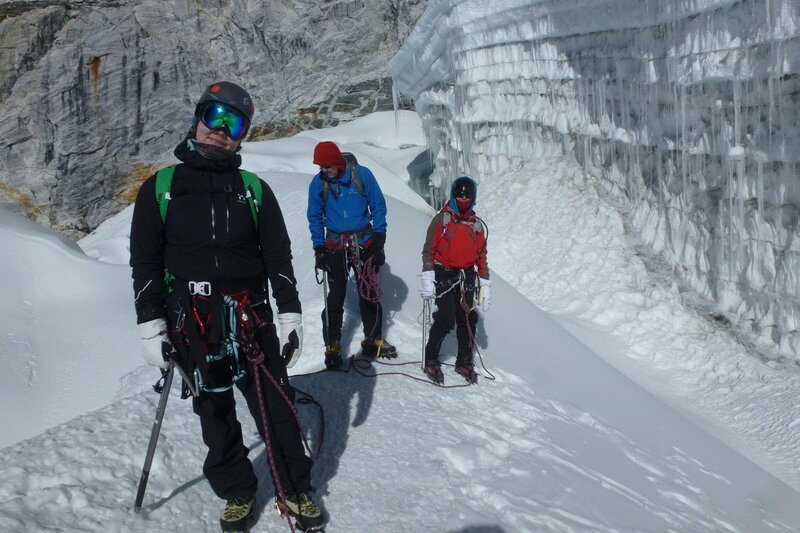 Initially, we will pass a glacier lake and continue along the side of moraine to the central part of Khumbu Glacier. From here, we will steeply climb to the Everest Base Camp. Reaching the Everest Base Camp, we will get to observe the majestic Mt Everest and its neighboring peaks. Overnight at Everest Base Camp. In the early morning, we will leave for Kala Patthar. 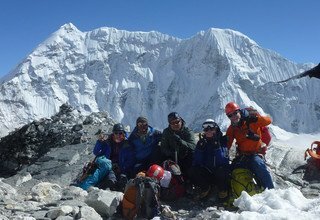 The trail steeply ascends to Kala Patthar which remains the greatest viewpoint to behold magnificent views of the Everest and other mountains in the Everest massif. We can treat our eyes with the stunning views of Mt. 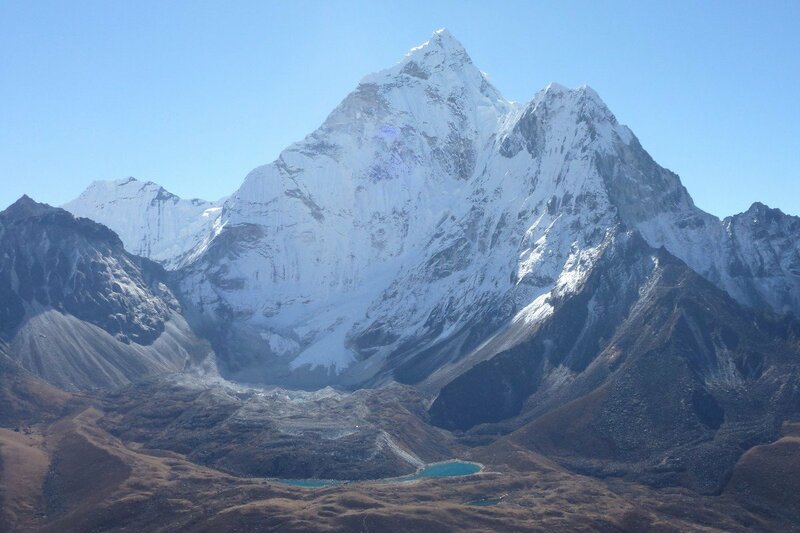 Everest (8848m), Nuptse (7861m), Lhotse (8414m), Khumbutse (6608m), Pumori (71665m), Ama Dablam (6856m) among many others. 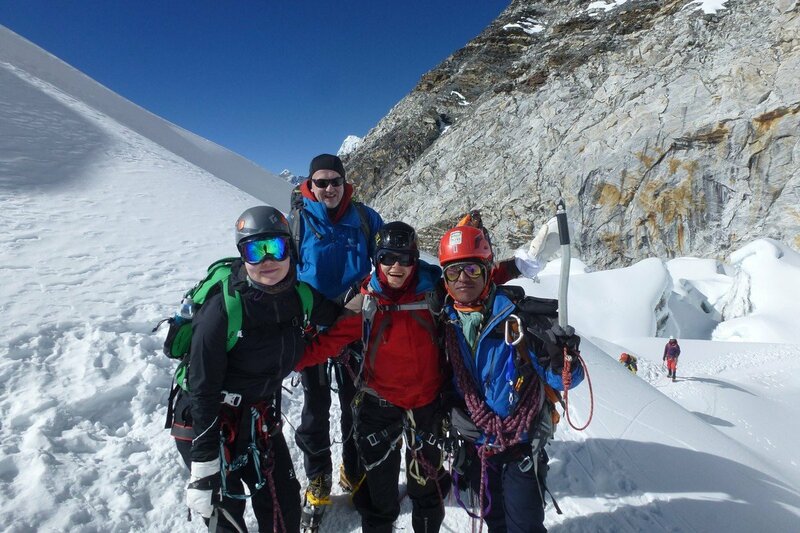 After spending some time there, we will descend back to our hotel, have some breakfast and head towards Lobuche. We will cross Changri glacier and continues to Thokla. From here, the trail gently descends to Dingboche. Overnight at a Lodge at Dingboche. Today, we first pass the Mani walls at the skirts of Dingboche. Then, we follow a trail that climbs along the rocky ridgelines to reach Chhukung village. Our trail initially continues along the open field used for Yak grazing by locals until Bibre. Leaving Bibre, we trek ahead to reach our destination for the day, Chhukung. Overnight at a Lodge at Chhukung. A short 2 hours of the walk along the rocky ridges will take us to Chhukung Ri. 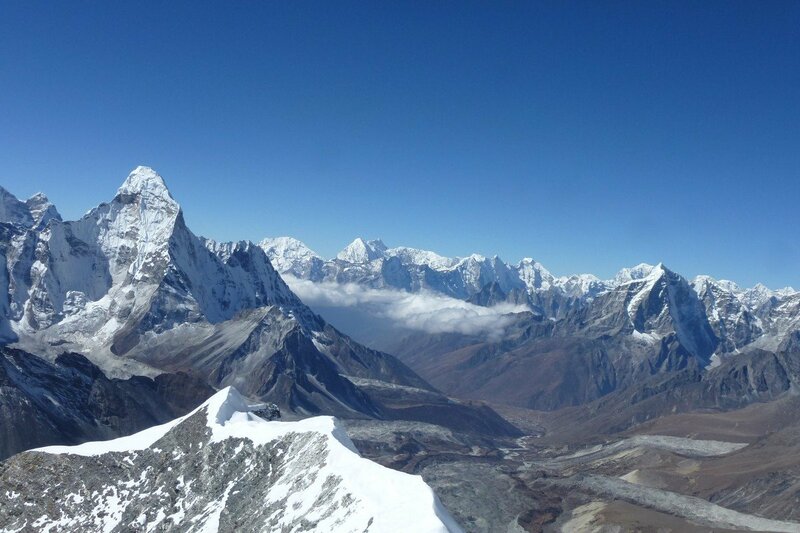 We can see the close view of Lhotse (8414m), Makalu (8463m), Island peak (6189m) and Cho Oyu (8188m) as well. 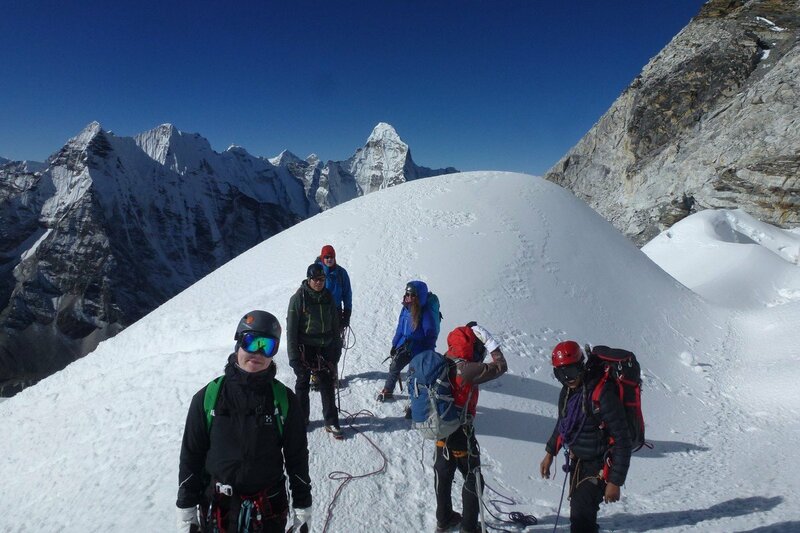 After enjoying the great view atop the Chhukung Ri, we descend and head towards Island Peak Base Camp. 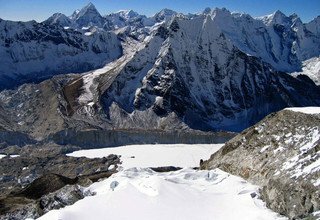 We can see Imja Tsho Lake on the latter part of the trek before we reach Island Peak Base Camp. Overnight at Base Camp. We begin the day by following the trail along the slippery and ascending trail. After some time, we can see the Lhotse Shar Glacier as we make way towards the High Camp. We will be continually accompanied by the mountains in the Everest ranges all the way to High Camp. After we reach the High Camp, we rest and practice for the climb on the following day. Overnight in a tented camp at High Camp. We will begin the ascent early in the morning. As the winds in the mountains tend to get strong during the middle of the day, we begin our climb as early as possible and walk along steep ridgelines and rocky channels to reach the summit. 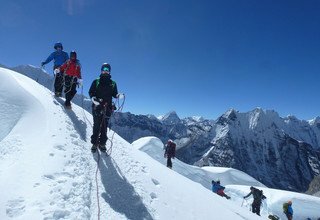 Upon conquering the peak, we are treated with mesmerizing panoramic views of the mountains such as Mt Everest (8848m), Lhotse (8414m), Cho Oyu (8188m) and many others. Enjoying the delightful views and capturing them in the cameras, we descend back to Chhukung. Retracing our steps, we head to Bibre from Chhukung. Moving ahead Dingboche welcomes us again and continuing further on ahead, we follow Imja Khola to reach Orsho. We walk on a short flat trail to cross a suspension bridge and make multiple ascends and descends to reach a suspension bridge before arriving at Pangboche. Overnight at a Lodge at Pangboche. We will begin our trek along the Imja Khola through the deep forests to reach Tengboche. From here, the trail descends along the Dudh Koshi River. Crossing prayer wheels on our way, we will reach Kyangjuma village. From there the trail descends along the forested path to Namche Bazaar. Namche Bazaar offers modern luxuries to some extent and we can enjoy them on our stay for the night. Overnight at a Lodge at Namche Bazaar. In the early morning, we will Leave Namche Bazaar. We will descend along the forests of rhododendron and pine along the Dudh Koshi River to Jorsalle and then to Monjo. Crossing several bridges and settlement area we will descend back to Phakding. We move ahead passing by prayer wheels and Mani walls to reach Lukla. Overnight at a Lodge at Lukla. On this day we will fly back to Kathmandu from Lukla. A scenic flight with the beautiful views of mountains will take us to Kathmandu. On reaching Kathmandu, we will drive you back to the hotel. You can spend the rest of the day by just relaxing or shopping at the local marketplaces. Overnight at a 3-star Hotel in Kathmandu. Day 19: Reserve Day in case of flight delays due to bad weather. The flight to Himalayan regions of the country is often a subject to delays or cancellations. Due to unpredictable weather, if we are unable to take the flight on the scheduled day, we have allocated today as the reserve day. This day will not be required if the trek follows the scheduled routine. On this day, we will drive you back to Tribhuvan International airport for your scheduled flight to your destination. * 4 nights accommodation with breakfast at 3* Hotel Marshyangdi in Kathmandu. * 1 experienced, helpful and friendly guide, 1 cook, porters (1 porter between 2 people), their food, accommodation, salary, equipments and insurance. * Camping Equipments (Tents, Kitchen Utensils and Mattresses during the climbing period). 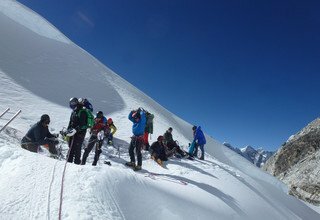 * Peak Permit, Garbage Deposit and Climbing Guide/Sherpa Equipments.